"Koyote Free Video Converter | Video converter aimed at beginners"
The freeware download presented here is called Koyote Free Video Converter. That’s a pretty self-explanatory name for a costless application that will enable you to easily and quickly convert video source material to other formats. As you landed on this page you’re probably aware of the fact multimedia and video comes in many formats. Here’s not the place to detail the reason why, but we do offer you a solution: Koyote Free Video Converter. What can Koyote Free Video Converter do for you? Koyote Free Video Converter is a fast and intuitive software for converting videos to formats suitable for portable devices. Hence, those among you who’d like to take their preferred videos everywhere they go, might be particularly interested in it. Nowadays, portable multimedia devices have become very popular as they offer the possibility of enjoying media content no matter where we are, but in order to make videos compatible with portable devices they need to be converted to a supported format. Koyote Free Video Converter is an efficient program designed for converting source video material in a wide range of formats into the most popular formats for portable devices, such as for PSP, iPod, Zune, iPhone and others. Koyote Free Video Converter stands out for its simplicity and fast conversion speed. Furthermore, it features an intuitive graphical user interface and displays all available options in a clear way. Although video conversion is a highly technical operation, this application makes it a breeze and doesn’t require you to have any related knowledge at all. For example, Koyote Free Video Converter features profiles and standard settings that make your life easy. First you’ll browse for your video source files or just drag and drop them onto the application interface, then you can select a profile which is a predefined combination of configuration settings. The profiles are conveniently named and you can select to burn a movie to a DVD or opt for converting a series of clips to be played back on your iPhone or Android smartphone, for example. As such, it won’t be necessary to alter any technical options and you’re ready to go. Koyote Free Video Converter features support for videos in formats like M1V, FLV, MKV, 3GP, MPG, WMV, VOB, AVI, MPEG, DIVX, MP4, ASF, among others. 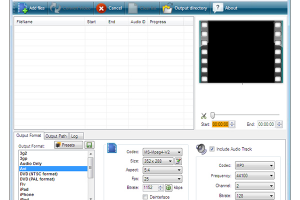 These can be converted into FLV, 3GP, MPEG-1, AVI, MP4, WMV, ASF, MPEG2, and others. Furthermore, this application also provides some additional functionality, including converting only a part of a scene, as well as extract audio from video source files and saving it as MP3, WMA, and other formats. Everyone will need to convert a video one day or another and to do so dedicated software is required. Koyote Free Video Converter is a suitable and easy-to-use solution, both for novice and experienced users. Moreover, it’s completely free, so why don’t you click the dedicated download button right now to add it to your toolkit so you’ll have it readily available when the day you’ll have to convert videos comes.